Our model’s hair is of medium length – about shoulder length - and layered. It is of fine texture that requires control to keep it in place. This style of updo controls shorter layers and gives the impression of longer hair. Begin by pulling forming the curls in the center back. Curl all of the hair, using a medium sized curling iron. Separate a section of hair in the front – from the ear forward and across the top. Clip it out of the way. Choose a strand of hair at the center back. Place a small amount of teasing or back-combing at the base of the strand. Spray the teasing with hair spray. Form the strand into a curl and secure it with a bobby pin. The teasing at the base will hold the bobby pin in place. Select a strand or hair near the first, tease the base and form a curl next to the first. Continue forming curls in the same way all around the original curl, pulling the hair up and back to meet the curl cluster. Tip: Don’t make all of the curls look exactly alike. They should be of similar size but they may be directed in different directions. Tip: Be flexible. You may need to un-pin a curl and move it or reform it to fit into the cluster of curls. When all of the hair at the back is secured into curls it is time to start forming the knots in the front section of hair. These knots are formed by creating a small braid – starting at the front hairline (behind the bangs) and braiding it toward the back. French braid for two or three turns, then lift the strand and braid it to the ends. Holding the end of the braid, twist it until it buckles – turning over on itself forming a knot effect. The knot should rest close to the curls in the back. Tuck the ends under the knot and slide a bobby in through it to hold the knot in place. Continue until all the front section, except the bangs, is formed into knots. 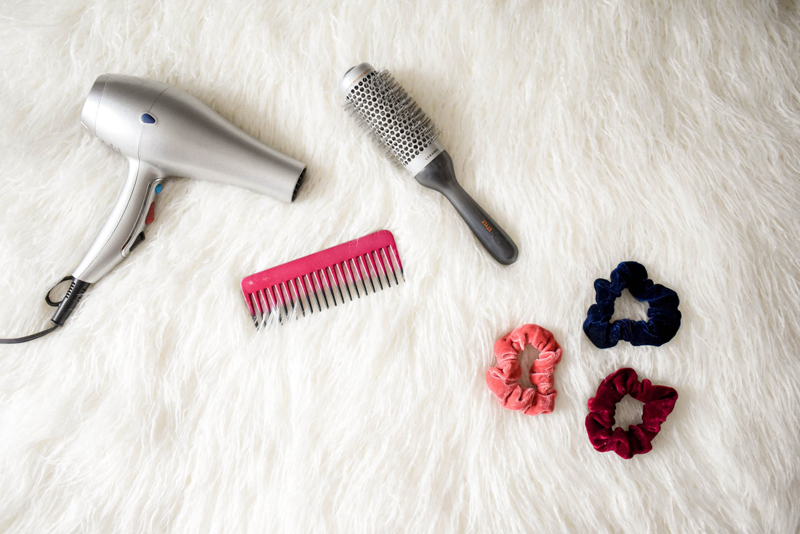 Spray the curls and the knots with firm hold hair spray to keep them in place all day. If you prefer straight bangs, as shown in the picture, use a large curling iron to give them a soft bend. If there is hair at the nape area that is too short to be included in the curls, use a small to medium curling iron to create curls that lay softly on the neck. Thank you to Selina of Elegant Styles Salon in Fort Wayne IN for this style. Updos for parties, proms, weddings or the office. Increased shine and strength with each use.